The last week has been so exciting! I've been making progress on some big goals, including one thing I never thought I'd do, so I thought I'd share this with you today. First, as I said last week, I've got a cover for my ebook! This was a big hurdle for me, because graphic design is elusive in my world. But I'm really pleased with how this came out. I took the photo during my last trip to D.C., when I visited the Franciscan monastery. Now I have to finish writing and editing a few pieces, then it gets sent to a few beta readers for testing, so to speak--and then it's almost ready for the rest of you! If you use an e-reader, what format do you use the most? Kindle? iBooks? Doesn't matter? Let me know! 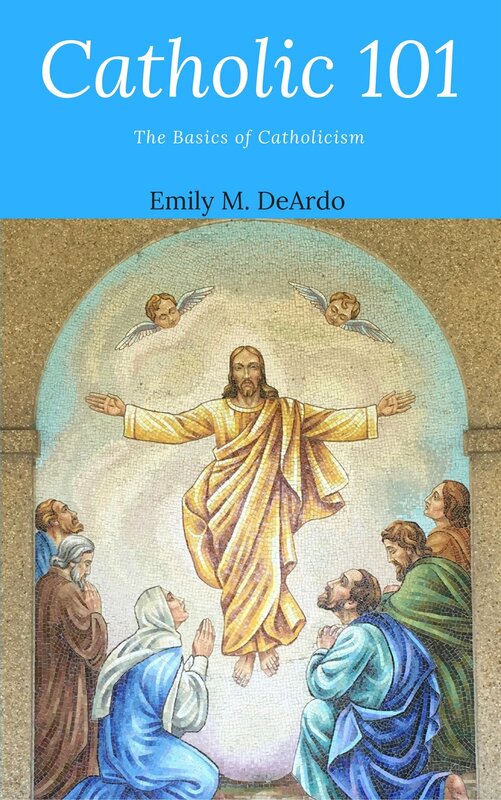 The ebook is based on my Catholic 101 series, but there are also brand-new pieces, to make it worth your while. I'm hoping to have it on offer later in the fall! The second big thing--I've decided to start selling some of my knitted pieces. Whenever I post photos of my variegated basketweave scarves, people always say how much they love them. And that got me thinking--would people buy them? Turns out, YES. I have three orders already! I'm really excited about this. I'm not planning on making this a huge thing, but I'm excited to be offering these scarves, and some other projects, in various styles and colorways. Right now I'm posting most of the information about them on Instagram and Facebook. So keep your eyes out--I might also cross-post some things here, too, when the pieces are available. Right now I'm sort of behind the gun because I had to order yarn for the projects, but soon I will have some available! Thanks for all your kind comments and support with my projects! I really appreciate it and I can't wait to share these with you in the near future.